Vegan Eats and Treats! 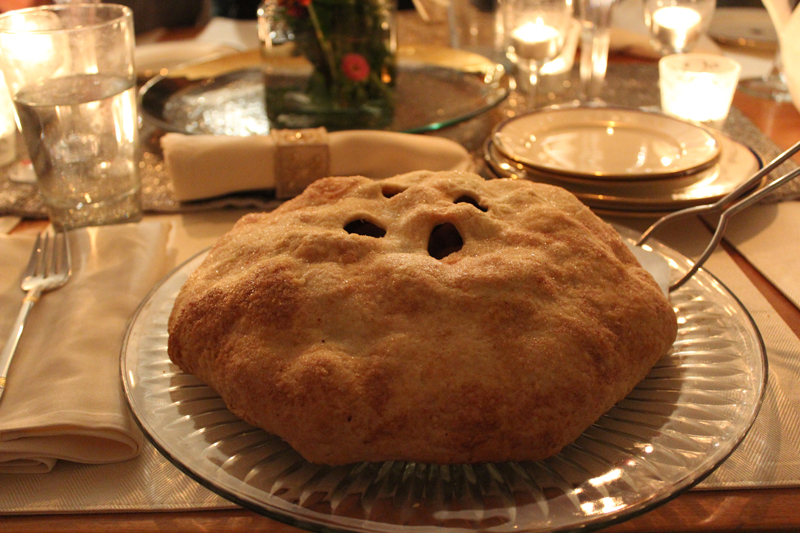 : Apple-Pear-Quince Galette with Spiced Rum ~ & Cookbooklette Winners! 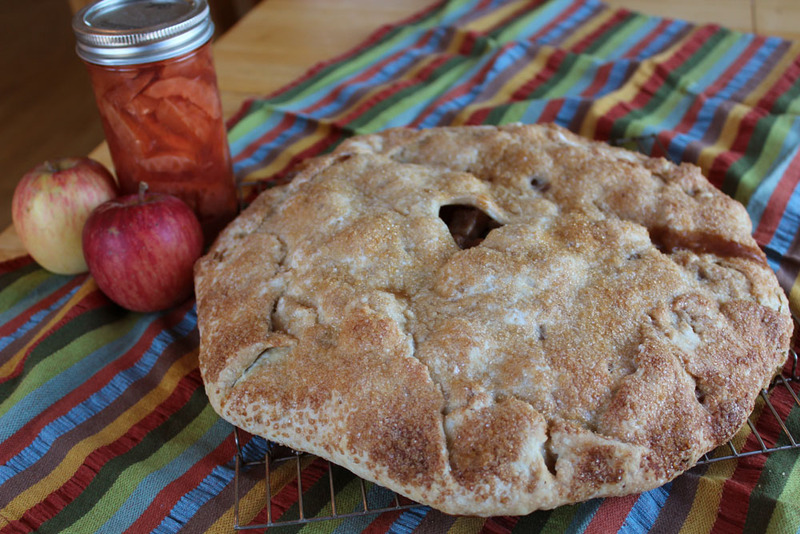 Apple-Pear-Quince Galette with Spiced Rum ~ & Cookbooklette Winners! Are you wondering what to make for Christmas dessert this year? Look no further! A long time ago, I found a recipe in an issue of "San Francisco Magazine" that caught my eye for a Holiday Apple and Pear Tart. It was easy to veganize, so I gave it a go and it was so much more than I could have ever hoped! This galette is SO DARN GOOD. 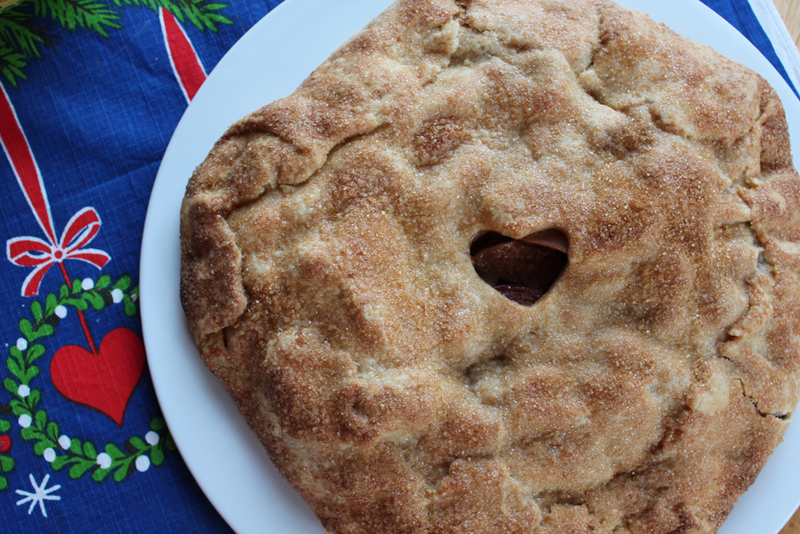 It is perfect and delicious and all you could ever want in an apple pie. It's flavored with spiced rum and tangerine zest, and it is an absolute dream. In fact, I have even won a pie-baking contest with this beauty. Years ago, my friends used to host a huge pie-baking contest with at least 20 entries - savories and sweeties and the whole thing was blind tasted and judged and very "official." I was the only vegan there and mine was the only vegan pie - and I won the grand prize with this beauty! I've made this galette so many times - for many different Thanksgiving and Christmas celebrations and it is a perpetual hit. Over the years, I also started adding in some spiced quince. My cousin Eliza has a lovely quince tree, and (happily!) I'm the only family member that seems interested in the annual quince bounty. So, I started looking high and low for quince recipes. I found a great one for Spiced Quince in Simple Syrup in Deborah Madison's book "Local Flavors." I don't use this book often, but the quince recipes inside pretty much earn its keep on the shelf. That little rosy jar of fruit that you see in this picture is one of my jars of canned quince. Adding in the Spiced Quince is totally optional, but it sure does add another element of flavor and complexity to this galette. The fruity, floral, spiced flavor of the quince goes perfectly with the other flavors in the original recipe. I usually replace one of the apples called for with an equivalent amount of spiced quince. I can't recommend this recipe highly enough! 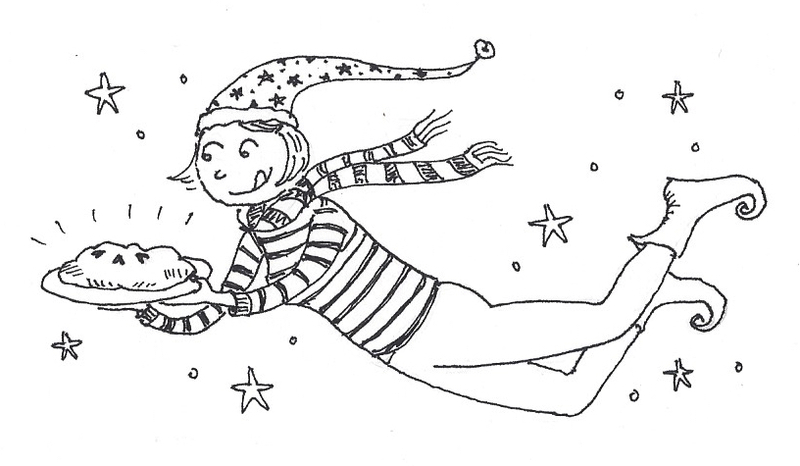 It will transport you and everyone you share it with to astral planes of culinary delight. First, Combine the currants and the rum and let soak overnight. Combine the flour and salt. Using a pastry blender or two knives, cut the vegan butter into the flour mixture until the pieces of butter are the size of chickpeas. Sprinkle the water over the mixture in three additions, tossing to distribute evenly. The dough will be a shaggy mass, moist and cool but not sticky. Divide it in half and form into balls. Wrap each in plastic wrap and flatten with the heel of your hand. Refrigerate until chilled. Peel and core the pears and apples. Cut the pears into cubes and slice the apples. Put the fruit in a large bowl, add in the spiced quince, if using (preserve the syrup for another use). In a separate small bowl, combine the sugar, cinnamon, ginger, nutmeg, cloves, and tangerine zest. Stir the vanilla into the currant-rum mixture. Heat oven to 375°F. Line a baking sheet with parchment paper. On a generously floured work surface, roll one piece of the dough into a circle approximately 15 inches in diameter. Transfer the dough to the baking sheet and sprinkle with about 2 tablespoons flour. Combine the sugar-and-spice mixture with the cut fruit and add the rum-soaked currants. Roughly arrange the fruit on top of the floured dough, leaving a 3-inch border around the edge. Gently fold this border over the fruit to make a strip about 2 inches wide around the circumference of the tart. Roll out the second piece of chilled dough, again about 15 inches in diameter. Using a small star-shaped cutter, stamp out shapes in the dough, not too close together. Moisten the edge of the tart with water and gently lay the second piece of dough on top, tucking the edges underneath the tart. Brush the melted Earth Balance generously on top and sprinkle with the sugar. Bake until the crust is brown, the juices begin to bubble, and the sugar on top is well caramelized, 45 minutes to 1 hour. Carefully slide the tart onto a cooling rack and cool at least 1 hour. Slice with a serrated-edge knife and serve warm with some vegan vanilla ice cream. from Deborah Madison's "Local Flavors"
1. Rub the fuzz, if any, off the quinces. Using a good sharp knife, cut away the skin in long, clean strokes, just as you would an orange, saving the skins. Remove the center with an apple corer (you may have to make the hole a bit wider than you would for an apple), saving the cores. Slice the quinces into wedges about 1/2 inch thick. 2. Put the skins and cores into a saucepan with 2 quarts water, bring it to a boil, then simmer, covered for 30 minutes. Strain. Return the liquid to the pot and add the sugar, spices, and orange zest. Stir to dissolve the sugar, then add the fruit. Place parchment paper or a heavy plate directly over the fruit to keep it submerged. Lower the heat, cover the pan, and simmer until the quinces have turned pink and are slightly translucent, 2 to 2 1/2 hours. If the syrup becomes too thick, add more water as needed. When done, store the fruit in its syrup in the refrigerator. The quinces should keep for 2 months. [ Smiles ] I am utterly pleased by this.